This coffee will be fresh roasted for you. 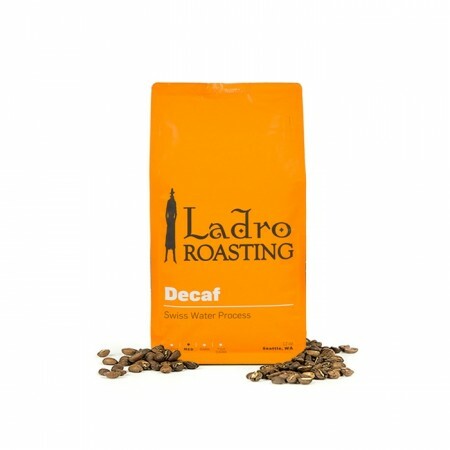 We expect Caffe Ladro will roast and ship this coffee in 1-2 business days depending on their roasting schedule. The Decaf Blend was carefully roasted for you by Ladro Roasting. A seasonal blend of Swiss Water process decaffeinated coffee from various growing regions. This cup is fantastically balanced, with notes of dark chocolate, roasted hazelnuts, and a subtle citrus acidity. I liked the notes and the roast. Easy to drink. Good flavor but more chocolate than I prefer. Not as bold a flavor as we prefer. Medium roast. This is not one of my favorites. While it does seem to have a smooth taste, it also seems to be a little too "organic." I don't know how to explain clearly but to me the overwhelming taste is that if wood (?). I just don't care for it very much.